They had the looks, they seemed to have the attitude, but alas, they did not have the talent. With Guns 'N' Roses taking the music world by storm in 1989-90, the search was on for bands with a similar sound and image. Briefly, Love/Hate, also from the streets of Los Angeles, were considered possible rivals for the crown that Guns 'N' Roses wore so unsteadily. 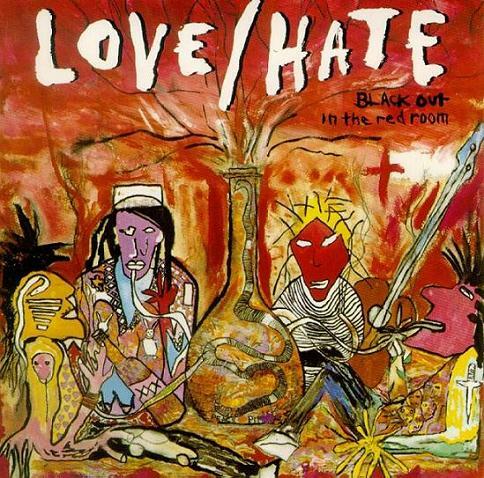 As it turned out, Love/Hate were nowhere near talented enough; Guns 'N' Roses were recognized as the one-offs that they were as the grunge tsunami obliterated metal and soon everyone was looking for Nirvana soundalikes. 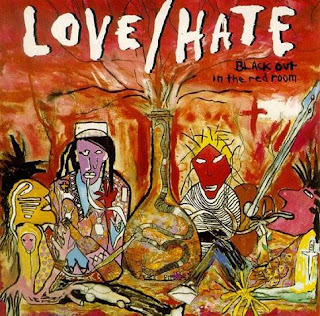 Black Out In The Red Room was the debut album from Love/Hate, lyrically obsessed with the standard themes of babes and drugs. After getting past what must be the worst collection of stage names assembled in one group, the opening title track is terrific and holds much promise with soaring vocals, simple but powerful guitar solo work, and a confident, purposeful melody. Little of that promise is fulfilled on the eleven tracks that follow, which are littered with forgettable songs that are rarely more than just average to moderately good. Rock Queen, Fuel To Run and She's An Angel are the best of the rest, standing out because they dare to step forward and rock with interesting song structures. The rest of the songs generally just lounge like lazy lizards.